A syllable is a unit of pronunciation, usually consisting of a vowel sound which may or may not be accompanied by consonants. 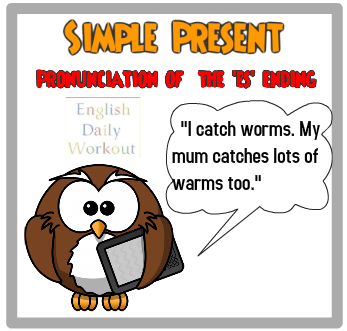 When a verb ends in a sibilant sound such as ch, s, sh, x or z, the es ending of the third person singular is pronounced as a separate syllable. The reason for this is that these sounds are so similar to the sound of the es ending, that the ending must be pronounced as a separate syllable in order to be heard clearly. In each of the following examples the bare infinitive consists of one syllable, whereas the form of the verb used in the third person singular consists of two syllables. other than c, g, s or z, the final es is not pronounced as a separate syllable. In each of the following examples, both the bare infinitive and the form of the verb used in the third person singular consist of one syllable.